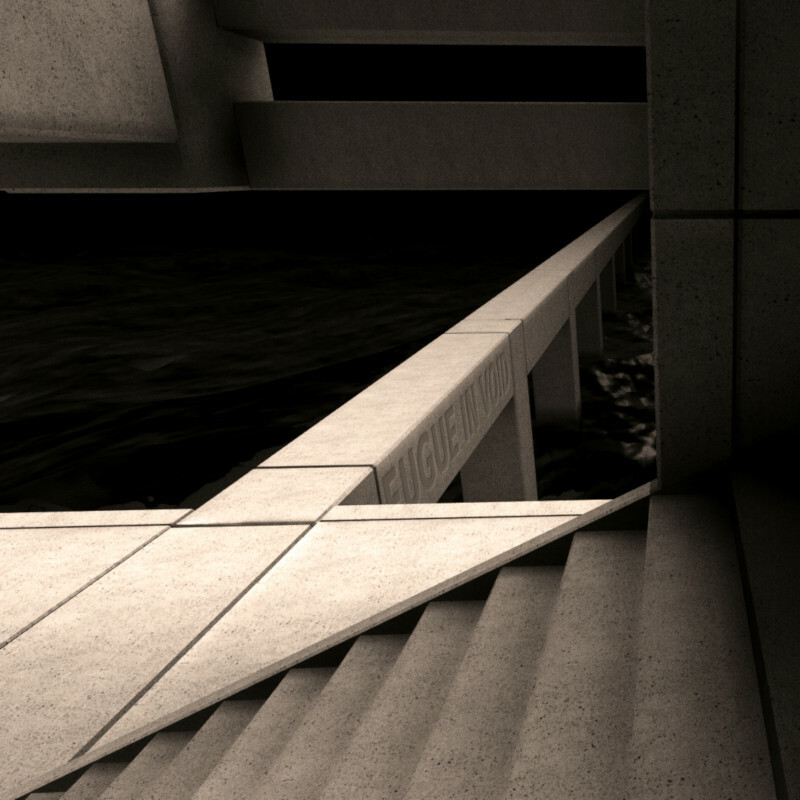 Fugue in Void by Moshe Link is a Brutalism-themed exploration game, and a journey through a world that is probably not the one that usually surrounds us, but a world that we surround ourselves. The developer describes it as the “perfect break from all those action packed games out there“, supposedly targeting those who prefer action before calm exploration, but it’s also a perfect game for those who are already fans of the genre. If you need a break, but still want to play a game, this is a good choice. If you are into the style of Brutalism or like to explore, this is also a good choice. My first, and lasting, impression was how soft and warm something as hard as concrete can be made to look, and this game is truly a beautiful thing. The play with light and coloured fog made me think of Sven Jonson, a member of a Swedish group of surrealists, Halmstadgruppen, active during the 20th century, and especially his blue, sacred arches. There’s also a slight play with contrasts between the strictness of the concrete and the waves of an ocean or a desert. Some of the colour schemes, later in the game, felt a little Dali. A short anecdote before we get started: just before playing I had read about a new archaeological find in my home town, consisting of what was possibly a path of procession flanked by wooden pillars for around 1 km. Such a procession path was also found in-game, so I thought of it as such, which seemed fitting in the context. The game starts with a 10 minute intro, which made me think that this was going to be an entirely non-interactive experience, but after those 10 minutes, you are finally given control and can start moving around on your own until the end (except for a few times mid-game when it’s taken away again for short periods of time). The intro visuals are nice together with the music, so you can just sit back and relax, although I could have wished for more time playing instead of just passively watching. I got a little disappointed at first, but once I realized I could move, which took up to a minute (after the fact), I was excited to finally be on my way. The game ends with an extended black screen, as if offering a chance to collect your thoughts and stay in the game before returning to the hustle and bustle of whatever else is awaiting you once you close the game window, which was a nice touch. On my first playthrough I got a little frustrated, because there was “too much action”: around an hour into the game, some of the places I got to visit had a timeout and urged me to move on when I much rather would have stayed indefinitely and actively choose when to leave (like one would in an art gallery). This caused a bit of stress, because I didn’t know if there was going to be a timeout or not in each place. You might also want to know that the game has loading zones (with no way of turning back once you enter one) which to me often came as a surprise before I learned where they are. On my second playthrough, I already knew about the timeouts and where they were, so then I could relax more and focus on exploring the places that allowed it (without leaving prematurely by accidentally entering a loading zone) — and, luckily, most of the places with the most to explore have no timeouts. The way I play these games is to explore everything, look at everything, and try to find good photo angles at every spot, which the game didn’t always facilitate, so, if you are anything like me, I recommend playing the game at least twice: it gets better, and truer to its intent, the more times you play it. The developer claims a playtime of around 45 minutes (supposedly including the 10 minute intro), but I did it in double that time, 1½ hour. If you are focussed on progression, you will probably do it in less, but I don’t recommend it (I even challenge you to finish it in longer time than I did (preferably while still actively playing it, so no cheating) 😎 ). Final words: Fugue in Void is a great game and a great representative of its genre, so if you like the genre, you will also like the game. If you are set on having “something to do” (other than exploring and taking photos), then you might want to play something else, but might also want to give it a try if it’s your first time, although there might be other games in the same genre that would work better as an introduction. ¹Like slight strings of light in the seems, some occasional z-fighting, footstep sounds that didn’t change properly in the sand area, and a few invisible barriers at slight elevations, which you had to push through. Posted in Indie, Review.Tagged 3D, brutalism, exploration, First Person Exploration, first person view, FPEG, indie.